PASADENA, Calif -- NASA's Mars Exploration Rover Opportunity today surpassed 20 kilometers (12.43 miles) of total driving since it landed on Mars 74 months ago. The drive taking the rover past that total covered 67 meters (220 feet) southward as part of the rover's long-term trek toward Endeavour Crater to the southeast. It was on the 2,191st Martian day, or sol, of the mission and brought Opportunity's total odometry to 20.0433 kilometers. To reach Endeavour, the healthy but aging rover will need to drive about 12 kilometers (7.5 miles) farther. 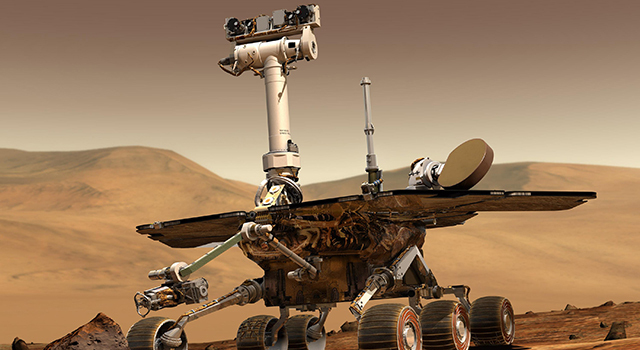 Opportunity's mission on Mars was originally planned to last for three months with a driving-distance goal of 600 meters (less than half a mile). 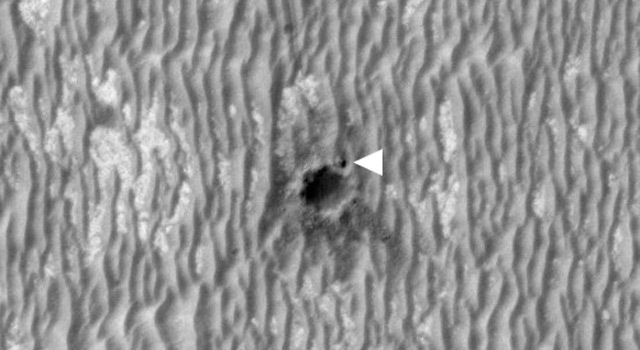 Since landing, Opportunity has examined a series of craters on the plain of Meridiani, and the journey so far has covered a portion of the plain with negligible tilt. Now, the rover is approaching a portion tilting slightly southward. Recent images toward the southwest show the rim of a crater named Bopolu, about 65 kilometers (40 miles) away. Meanwhile, Spirit, Opportunity's twin, is continuing minimal operations due to declining solar energy with the approach of winter in Mars' southern hemisphere. Spirit has been communicating on schedule once per week. It is expected to drop to a low-power hibernation mode soon that could prevent communications for weeks at a time during the next several months.